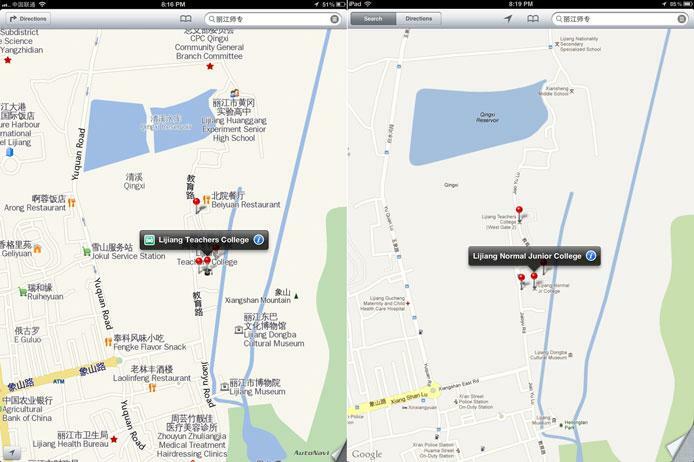 Maps in China in iOS 6 (left) are more detailed than the previous Google Maps (right). Screenshots via Anthony Drendel. Apple's Maps in China are more detailed than competitors thanks to data provided by AutoNavi Holdings, The Wall Street Journal reported on Tuesday. It is the most widely used mobile mapping service in china, making navigation systems, virtual maps and satellite images. However, Apple's special version of Maps in China does not integrate data from TomTom, which is used for mapping data around the world outside of China. As a result, Chinese users who want to look at other countries outside of their own cannot access landmarks or public transit stops. Apple's unique-to-China maps also lack spoken turn-by-turn directions, or the 3D flyover feature that is available to other worldwide users on the iPhone 5, iPhone 4S and new iPad. Instead, users in China can only access written directions, and satellite imagery for other countries is displayed in black. The problem comes from the fact that only 11 companies in China have licenses to do comprehensive mapping, according to the Journal. Half of those companies only support the government and do not make commercial-level products. Citing an unnamed source, Wednesday's report said that integrating AutoNavi apps from China with other data from around the world would be an incredibly complex undertaking, which is why the detailed mapping data is restricted to China. 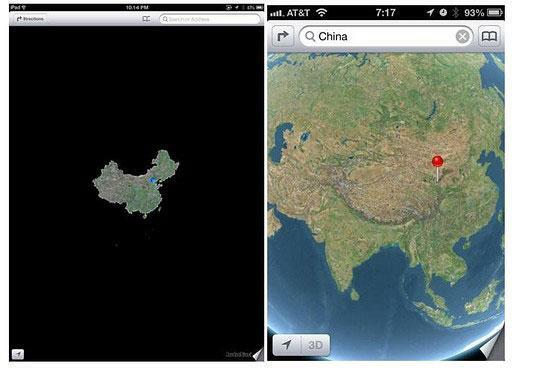 Chinese iOS 6 users cannot access satellite imagery outside of China (as seen on the left). Screenshots via The Wall Street Journal. Still, user Anthony Drendel wrote on his blog that iOS 6 Maps are "a huge improvement over Google Maps" for the 1.3 billion people who live in China. There, he said, Google Maps "was always pretty terrible." "In the big cities and tourist centers, it was passable," he said. "once you left China's large metropolises, however, you were pretty much on your own." But with the use of AutoNavi in China, iOS 6 Maps now have far greater detail than Google Maps provides. Google's hands are tied because the search company is not among the 11 mapping companies authorized by the Chinese government. "In my experience, the new version of Maps zooms in much further, shows more points of interest, clearly labels banks and cellphone shops (China Mobile, China Unicom, and China Telecom), and gives the locations of ATMs and public restrooms (my original iPad running iOS 6 doesn't show either of those things)," Drendel wrote. "The killer feature, though, is that iOS Maps shows both English names and Chinese characters for everything, whereas Google-powered Maps only shows the English translation." With the release of iOS 6 last week, Apple officially dropped Google Maps data for its built-in Maps application on the iPhone, iPad and iPod touch. Instead, the company how offers its own in-house solution that users have said is not as good as Google's offering found in previous releases of iOS.